To offer The Best Movie going Experience to our Valued Customers, we are proud to be the 1st Independent Theater in The State to offer "State of the Art - Second Generation" Digital Projection & Sound with "RealD" 3D capabilities in all Theaters!! Come...Enjoy the Show! *Note: Features presented in Digital 3D are an additional $3.00/package....$12.49/$15.99 respectively. All members of the armed services are matinee prices for all shows with valid I.D. Every Thursday we give college students a break. Bring your student I.D. to our box office and pay matinee price for admission. 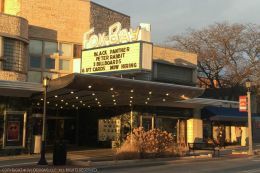 This movie theater is near River Hills, Milwaukee, Glendale, Brown Deer, Whitefish Bay, Bayside, Fox Point, Shorewood, Wauwatosa, Mequon, Thiensville.